This store, gas station and ice cream booth on the south-west corner of Trafalgar Road (7th Line) and Dundas Street was photographed about 1940. The two-storey central building in this photograph is the original Post's Inn, according to Town of Oakville Heritage Planner, Carolyn Van Sligtenhorst in May 2016. Two other photographs of the south-east corner of the intersection, showing the Trafalgar Township (or Twp.) Hall, have been added to this record for your further information. In the 1950's, Ogden's was the place to go for good ice cream. 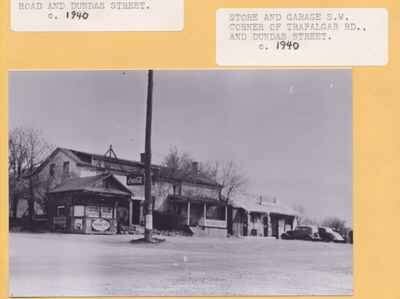 The Inn was torn down in the late 1960's. Post's Corners was one of the first hamlets in Trafalgar Township. It was located at the intersection of what is now Trafalgar Road (Seventh Line) and Dundas Street, Oakville, Ontario. The Post family owned the land on two corners of the intersection, purchased ca 1806 and 1816, resulting in the village name, "Post's Corners". As of 1858, the hamlet was known as Postville. Thanks to the research of Michelle Knoll, we know that the Post family built the Post's Inn in 1818 (Lot 13 1 SDS). The stage coach started in the 1820's with 2 coaches running daily from Toronto to Dundas, the village just north of Hamilton. Mail was the primary business of the coaches, passengers as well. Postville being a changing station for the horses, there was also a large stable. A second stable was later added on the north side of Dundas to accommodate up to 50 horses. The Inn was first run by Ephraim Post. It had 5 fireplaces. There was a shed behind the Inn which stored items of the local militia for military drills. Much local business was done at the Inn. There are records of ward elections taking place there until at least 1852. For a short time during the temperance movement, the hotel was a temperance hotel. By 1833, coaches were using the Lakeshore road and steamships were running to Hamilton, thus reducing the need for the Dundas stage coaches. When the railway started in the 1840s, the Inn was less important. Son Hiram took over management in 1841. At this time, a two-storey addition was added across the front. The 1857 Tremaine's map shows the property was owned by Benjamin Thompson. James Young was running the Inn in 1876 when George Baker took over and remained until his death. This complex was owned by Bob Fairman in the 1950s. Dent's store and gas station were right on the north-west corner, with Bradley's Hardware store a bit further west along Dundas. Road and Dundas Street. c. 1940. Store and garage s.w. corner of Trafalgar Rd., and Dundas St., c. 1940. Ezekiel Post, 1771-1838. Ephraim Post, 1776-1851. Hiram Post, 1803-1860. Ogden. Jordan Daniel Munn, 1809-1892. James Young. George Baker. Robert Fairman. Thompson E.S. Post, 1856-1889. Frederick J. Post, 1886-1978. Dent. Bradley.